Aerodynamicist Paul T. Glessner's significant experience in the aerospace and motorsports industries has propelled him into both Vehicle Aerodynamics Consulting and Seminars. Incorporated October, 2005 as Vehicle Aerodynamics Consultants, Inc. Consulting: Paul and his team at Vehicle Aerodynamics Consultants (VAC) has shown many a motorsports team, company or organization the benefits of a vehicle's aerodynamics design. If you have a land-speed vehicle, a road racer, an Indy car, a dragster, an airplane or a 'space'plane, Paul will always find a way to exploit the rules and/or the air and give your organization the "Unfair Advantage." 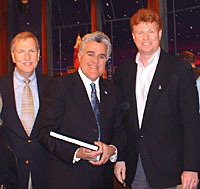 Paul T. Glessner introduces Ted Robertson, SAE President, to Jay Leno and presents 100 Years of the Automobile gifts from SAE. Paul is currently involved with numerous supercar designs and a supersonic business jet pushing hypersonic and has been involved in a World Land Speed record design as well as a space-plane design that is shown every other month is Aviation Week & Space Technology besides other unique projects. These projects and the ability to get solutions to almost any aerodynamics problem should put Paul into anyone’s PDA. Vehicle Aerodynamics Consultant's Computational Fluid Dynamics team can handle any vehicle design of this Earth or – out of this world. Seminars: Paul T. Glessner personally conducts a highly respected seminar to explain and expound on the mysterious powers of airflow over road vehicles. Designed for the interested novice as well as the technically-minded, the 8-hour seminar covers almost anything you would need to hold your own at the race track - or at the dinner table - on the subjects of downforce (DF), drag (CD), wind tunnels, Computational Fluid Dynamics (CFD), flow-visualization, vehicle coastdown, aerodynamic devices on commercial and racing vehicles, and more. Please view Testimonials as well. Paul has spoken at the seemingly "Triple Crown" of speaking engagements in 2005: SAE's headquarters in Troy, MI., SEMA's 29th annual Las Vegas convention and Performance Racing Industry's symposium in Orlando. He spoke again at PRI's event, December 4th, 2006 in Orlando. Paul will come to your organization or company if 15 individuals are gathered for the all day course. He can speak for an hour or two or four. Fees can be discussed for any gathering as a function of travel, number attending and seminar length. Have him come to your next distributors gathering as a 'bennie,' or to your retail store, racing school or car gathering as a draw. Anything that is automotive, aircraft or aerodynamic related. Click Seminars for further explanation, fees, materials, scheduled events and course content.